Posts categorized "Santa Cruz (County)"
I had the pleasure recently of shooting at one of my favorite locations - Nestldown, in the Santa Cruz mountains, with the beautiful Ashley and Jared! It was a delight from start to finish. Here are a few of my faves, or if you'd like to watch the slideshow, you can do so by clicking on Jared and Ashley's Nestldown wedding slideshow here. It's a rare treat to get to shoot my friends' weddings, and I was privileged enough to do so when I shot Jamie and Jonathan's big day recently. I have known them both for a long time; I don't even know how many years I've known Jamie (and her family), but definitely an awfully long time (20+ years? ), since we were very young, and I've known Jonathan (and his family) for about 10 years now, and so I was thrilled when they asked me to shoot their wedding. Jamie and Jonathan are fun silly, sweet and kind and so clearly adorable together (and separately! ), which makes them not only great to simply be around, but also very fun to take pictures of. I loved getting to be part of their wedding, and taking pictures of shooting them. Like I said, they (and their wedding party/family) are silly (in the best possible way), and were willing, ready and able to pretty much anything I asked them to do, in fact, they suggested some of the wilder shots we took that day, and in doing so, created some incredible shots. There are very few people as committed to photography as to design and paint special backdrops just to take pictures in front of, but they did(!) and we have some great (if I do so obnoxiously say so myself) photos because of it. In fact, Jonathan loves photography like I do, and has worked as my assistant on more than one occasion. It was apparent that everything had been considered; the colors, the candy bar, the button cake, the stunning flowers [by Katie Gonzales], and it was so obvious how much care, thought and time they had put into everything, down to the tiniest things, like the label on a cookie jar, and being such a fan of details, I was not disappointed (and could of course, not stop taking pictures!). But besides the aesthetic, and most important, it was a wedding of friends (not just Jamie and Jonathan, their wedding party and their families, but their guests, too) which is always fun; to be in the midst of people who know me, and aren't afraid to be just as crazy and silly (or sillier in some cases) as the bride and groom. And not only that, but a bunch of them went above and beyond, surprising Jamie and Jonathan with a 'Thriller' dance during the reception (it was so fantastic, and so funny it was hard to believe they'd only had a few practices before the reception). The day was full of joy from the first to the last. When I arrived at the Jordans, everyone was stress-free, laughing and joking while they got their makeup and hair done, then right as the ceremony began, and I caught Jonathan dancing a jig with his brother immediately before he walked down the aisle to get married, to the ending of the reception, when masses of colorful confetti rained down on the dance floor, to all their friends lining up and creating a gauntlet for them to run through, to get to their car. It was a beautiful, special day and I was thrilled and honored to be asked to take part and record it. And while shooting their wedding was admittedly a blast, even more so, I loved getting to see Jamie and Jonathan together on their special day. They (and their families) are both very dear to me, and I wanted to bless them, and hopefully give them photos they will love and cherish, and more than anything else, and to be able to capture who they are together through the lens as clearly as I see them with my eyes. I hope I've done that. The gorgeous flowers were done by Teressa, of Bonny Doon Garden Company, who is not only uber talented (and specializes in organic flowers), but a wonderful person too; it was fun to get to work with her again! There are some pretty shots of her bouquets below, after the jump. I have to talk about their first dance, which was so great! They started off slow, but then quickly got down and busted a serious move. Below is a shot of the 'serious' part, right before the fast music started, and I love this shot. There are a series of hilarious dancing shots that you MUST see, including a moment where Sean whipped his tux jacket off and threw it into the audience (I was so stoked that I captured it! ), but there were so many great dancing moments that I'd be remiss if I didn't include a few of them, after the jump, but in order to fully appreciate the fun and wackiness that was their first dance, you should definitely check out the slideshow!! Here's the throwing-the-jacket moment...(like I said, more fun dancing shots in the slideshow, and below after the jump). The ceremony...is Holy Cross not just completely lovely? How I love the long veils! First of all - I'm so sorry I've been gone so long!! I've been in crazy-wedding-editing land for the last few months, and I know this blog has seen neither hide nor hair of me, and I while it may look that way, I haven't abandoned the blog! I've just been extrememly busy. I've had the pleasure of sh0ooting so many amazing, fun, distinctive and gorgeous weddings in 2008, and I wanted to (properly) share them with you! And I would have done so along the way, however, due to all the time and energy I put into each one of my weddings I haven't been able to find the time to actually blog about them (and I like to talk about the day, not just throw up a bunch of photos, which is why blogging about them takes me a little extra time)! 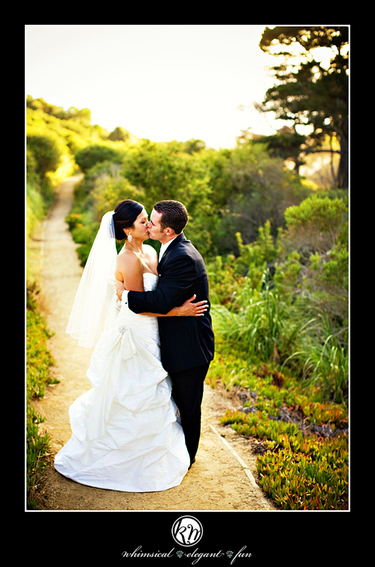 But now the madness is finally easing up a bit, and so I thought I'd start back up again with one of my wonderful couples; Leslie and Scott, who had their wedding at one of my favorite wedding locations in the entire Bay Area; Nestldown! First of all, I must apologize to Leslie, as she's been wanting to see some of my favorites on the blog for awhile, and she has been incredibly patient in waiting on me to have time to write about her beautiful wedding! So thank you, Leslie, for your patience! Now, on to Scott and Leslie's Nestldown wedding! (A quick aside: I learned last year that it's NOT Nestledown, but Nestldown, with no e! Yet every time I write it, I have to keep going back and deleting the e, since it seems like it should be there. Plus, for those of you who didn't know there was no e in Nestldown, I didn't want you to think I was continally mis-typing it). =) Glad we could clear that up! Now on to Scott and Leslie's wedding! I liked Scott and Leslie the moment I met them, when they came for a wedding consultation at my house. They were referred by a good friend of mine, Melina, and I was so glad she referred them to me. Not only did I like Leslie and Scott right off the bat, but I was thrilled when I heard they were going to be married at Nestldown! Double bonus for me! And their wedding did not disappoint! Not only was every detail carefully thought out, but they made such gorgeous choices! From the largest to the smallest details'. Everything was classy, yet stylish and modern. The cake was completely different than any other cake I've ever seen, and all their other details were perfect for photographing them (and looked even better in person! ), the table-number cards, the place settings, the flowers (which were lovely) and bouttonieres and table arrangements, and all the other choices they made, it was just a lovely wedding, and very well done. Leslie has great taste, and made my job super-easy! I'll talk about more in detail below. Leslie, getting ready and putting her earrings on. So as I said, I felt really lucky to be asked to shoot a couple weddings at Nestldown this year, and I say 'lucky' because I really do love it, for so many reasons and while I already discussed some of the distinctive features on Nestldown, in a previous post about another wedding I shot there, I thought I'd give you a quick refresher, in words and pictures, since it's been awhile. =) To begin with, the property is not only so beautiful, but it's completely unique, as I talked about previously (the aforementioned post when I shot Jen and Jame's wedding there). Scott and Leslie kept the decor around the ceremony fairly minimal, with small green flower balls, tied to the backs of the chairs along the aisle, which kept all the focus on the beauty of the location itself. Married! I love the expression on Leslie's face -- such elation. Surrounding the ceremony location there are nooks and crannies just waiting for photos to be taken. The shot of Scott and Leslie below was taken just above where I stood to take the ceremony shot, (two photos above). If you look (two shots above), you can see the little (willow?) bench. That's where they went to sit, immediately after the recessional, when I looked up (from shooting the guests leaving), and caught this sweet photo (I was somewhat hidden amongst the foliage, and I don't think they were even aware of me -- or anyone else, for that matter, as they were in a little world of their own. 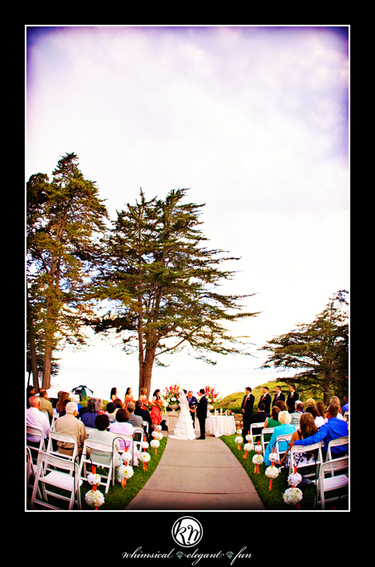 While it's fairly obvious that I love Nestldown's ceremony site, the rest of the property is just as beautiful, and as I said, Scott and Leslie took great advantage of it, using almost the entire property to perfection. And while the redwood glen is certainly amazing and show-stopping, it's only one of the many unique places dotting the property. To mention just a few: there is a mini-train and tracks snaking all throughout the grounds (which is such a great way to make a grand entrance into the reception, as Scott and Leslie did, as well as to entertain and give rides to the guests and their kids). There is also a really nice (and I think relatively new) large barn, which sits alongside another sparkling pond, (topped with lilypads, and full of koi, and which I find myself unable to resist shooting continally -- there's food for the koi, and the guests were feeding them and of course, I was right there with them, snapping away! ), and next to the barn and the pond is a large grassy area, where Scott and Leslie had the dining tables, for dinner. The barn area, where appetizers and drinks were served, with the barn in the background. As I mentioned, I loved all of Leslie's choices. They had multiple table centerpiece arrangements, (other styles below, after the jump). I particularly liked this one, with the three separate flower arrangements. From the lawn, as it started getting dark, everyone made their way into the barn, where all the dancing, cake cutting and revelry was held, (and I'll talk about all that fun and craziness more below). Oh! And I almost forgot, there is also an incredible tree fort, (which I used to do some of the groomsmen's photos, below), and a small, Alice In Wonderland house, just big enough for little girls, surrounded with shrubs shaped like animals, and next to the train tracks. When I tell you it's a dream, it really is! I don't think there's anywhere like it in the Bay Area. The groomsmen, up in the tree fort, for their portraits. I loved getting to be there, to shoot their big day, and one of the things that made it so fun for me, (besides Nestldown, whcih I love, an besides the gorgeous colors and flowers, was Scott, Leslie and their bridal party). I had a lot of fun shooting them all, and the guys were very sill and playful,, which is always fun for me; to have people who are totally at ease in front of the camera, and are in fact suggesting ideas for photos -- really, could a photographer ask for anything else? As I said, everyone was great, and the groomsmen were all very fun, (and silly, as above). Some of their 'portraits' were really funny too, they were suggesting shots right and left (some are below, after the jump). This was an impromptu shot, as he saw me walking around the reception, looking for different candid moments, and I whipped my camera up just in time to catch him! Too funny. While the bridal party was great, the guests were really awesome too, they jumped right into dancing, and the dance floor was literally packed the entire night -- in fact, we got some incredible (and somewhat crazy; which I have to admit, I love) photos from the dancefloor. So I pulled some of my favorites to show on the blog (and there are more below, after the jump), but if you'd also like to see a slideshow from the big day, then you can do so by clicking here, to be taken directly to the slideshow. The dancing was SO crazy and fun! The DJ did an incredible job, and kept everyone on the floor from the moment the dancing began, 'til Leslie and Scott left. He also had some seriously awesome lighting, which allowed me to get some really fun shots, like the one below, which I absolutely LOVE! Really, I feel like I'm beating a dead horse, but this was really such a fun, gorgeous, entertaining wedding! The bride and groom, and their guests, friends and family were all fun and ready for a party, and of course, Nestldown looked beautiful -- Leslie did a great job, and the staff were quick, friendly and efficient and kept everything moving right on track the entire evening. I was honored to be asked to shoot Leslie and Scott's wedding, and I had a great time, which I hope is conveyed by this blog post, (and hopefully I *don't* sound like a broken record!). Thanks so much, Leslie and Scott!! If you want to see some more of my (many) favorite photos from the day, you can either go see the slideshow (link above), or, feel free to browse through some more of my favorites, after the jump, just click on, ''continue reading.." directly below. 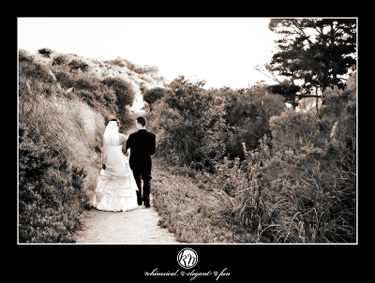 Okay, enough of my apology, and on to Brian and Kristin's beautiful Seascape wedding! The wedding was gorgeous, and the day was crazy, weather-wise: while the day started out beautiful, (in fact, it was really hot and muggy at the beginning of the day -- you can even see a shot of Kristen with her dress practically up and around the fan while getting ready it was so hot), but then it quickly (during formal portrait time, of course! ), morphed into a down-pour, and finally, during the ceremony, back into blue skies again.So it was a strange day weather-wise, but it was a wonderful day, wedding-wise. 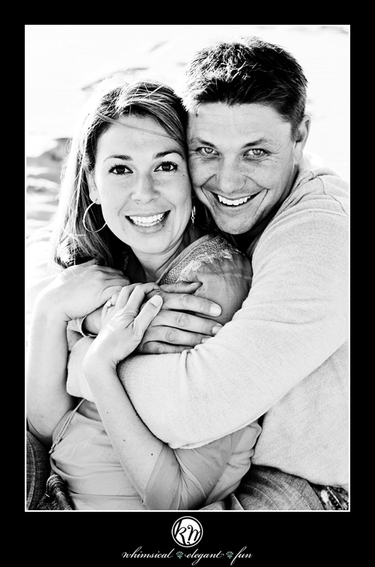 Kristen and Brian are both really fun, outgoing, silly (Kristen is especially silly, which is a positive personality trait in my book), and they seem like such a good match for one another. They're one of those couples who you can just tell really love one another to peices, and while I get to shoot those couples in love on a weekly basis, the way they felt about one another was evident whenever I was with them, which is a wonderful thing to be around (especially for a sentimental sap like me!). So after the gorgeous (if somewhat puddly, in the beginning) ceremony on the bluff of Seascape Resort, (which for those of you who are local, know is a beautiful place to get married in town; arguably one of the prettiest spots in town to have a ceremony), after some family portraits on the bluff, swung inside to get the party started. And what a party it was!!! It seems this year I've been inordinately blessed with really super-fun receptions, and this one was no exception. Their family and friends were more than game to hit the dance floor and it seemed that from the moment they opened the dancing, to the very end, the dance floor was PACKED with people, which not only makes it more fun, as a photographer, because there is always SO much action on the dance floor, but fun for everybody there - to have so many people singing and dancing along with the music -- it was just really fun to get to capture. In particular, Kristen's uncle (I think that was how they were related...?) was just going for it, and dancing like there was no tomorrow, and it was SO hilariously funny, because he was this somewhat staid (at first glance) looking guy, yet when he got on that dance floor he was yelling and dancing and shaking to "I Like Big Butts," louder and more enthusiastically than almost everyone there. I am almost embarrassed by how many shots there are of Kristen and her uncle dancing. I even had a hard time, at one point, holding the camera steady, because I was laughing so hard, I had to practically slap myself to stop from shaking from laughter. In general, I'm not a big fan of 'The Circle,' (you know what I'm talking about: where everybody makes a big circle on the dance floor, and people take turns -- or not -- dancing in the middle while everyone was watching). However, I was grateful for the circle, because it made it so much easier to take shot after shot of everybody busting moves on the dance floor (particularly Kristen and her uncle). 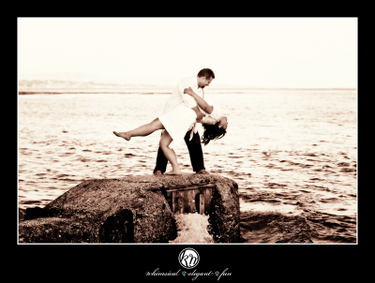 And finally, after the reception and all the crazy moves on the dance floor,we whisked Kristen and Brian out of Seascape and took the golf cart down to Seascape's private beach to shoot their wedding portraits. And despite having shivered through the rain in the morning, and sweat through the muggy afternoon, eaten dinner and danced the day away, I couldn't believe how beautiful they both still looked, after waiting for the end of their big day to shoot their portraits. And as the weather had earlier, when we were trying to do family and bridal party portraits, it interfered again, this time on the other end of the spectrum. 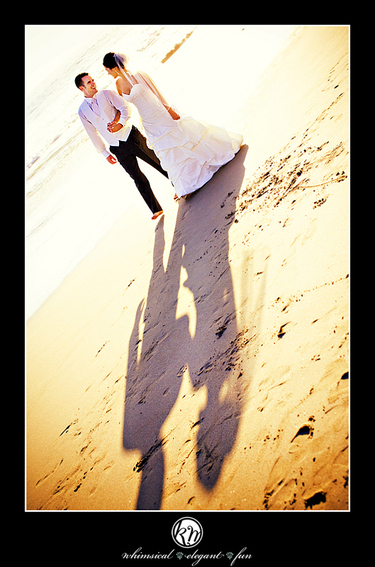 The above shot is a good example of the crazily intense bright light -- look at how crisp and dark their shadows are on the sand, and how strongly backlit they both are; they're practically glowing. So I know I'm going on and on (how unusual, I know! 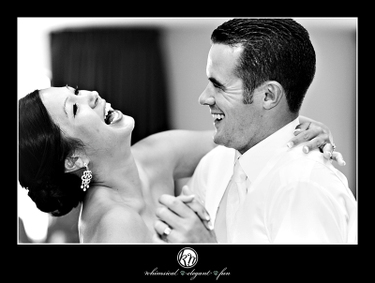 ), but I just want to convey how much fun I had at their wedding. I always enjoy myself shooting weddings, but their wedding in particular had such a high level of revelry that I've seldom seen matched in reception-goers, and that, combined with Kristen and Brian' obvious 'right-ness' together made for a really wonderful, joyous celebration. 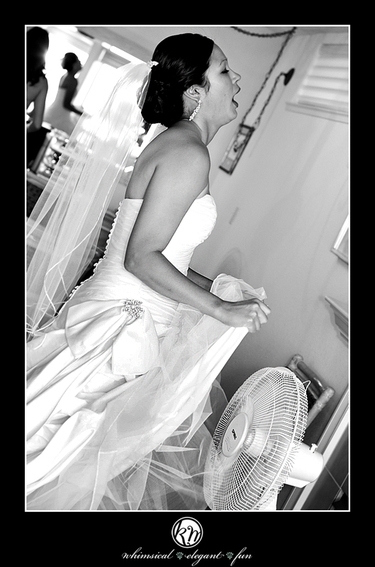 I was (and am) delighted that they chose me to shoot their wedding day, and hopefully some of my favorite photos (below, after the jump, click on 'continue reading...') and the slideshow are able to convey, in a small way, a sense of their beautiful, joy-filled day. I was thrilled when Monica decided to have me shoot her wedding, because I actually know her family fairly well, and she'd nannied for us for about as month last summer, when Megs was on vacation, but I knew her sisters Allegra and Emilia (and her mom Yolanda), better than I knew her, , because we all go to church together (and Monica and Brandon go to Coastlands as well, but we have been going to different services, so only ran into each other once or twice. So not knowing them as well as I'd like, I was really looking forward to getting to know Monica and Brandon better, and I wasn't disappointed. We ended up having a super-long conversation after the shoot, which I'll tell you about more below. (And as always, if you want to see these photos larger, just click on them, and they'll pop open larger!). Despite the light being rough on the beach, it was ultimately a good thing, because look at how gorgeous it made this photo!! And they're so cute too!! After the photo shoot, I drove them back home, and we got into such an involving conversation that we sat outside, in my car, talking for more than a half hour. And as much as I love shooting, and composing shots in my head, and playing with couples whlie shooting, I absolutely love when I get to really know people; who they are, where they've come from, and all of those fun things. And as we talked, it became more and more evident that the three of us came from very similar situations in our background, and I felt like we really understood one another. Another thing that was also super-fun, was while talking to Brandon, we discovered that we knew TONS of the same people, (which isn't as uncommon as you might think, as Santa Cruz is really a very small town, Aptos/Mid-County in particular, and we always joke that in Santa Cruz County, it's not six degrees of separation, but 2-3, because it really does feel like everyone who's grown up here knows at least someone you know, if not more), and because Brandon and I had grown up in Aptos, (I think we even graduated high school the same year), that we both knew and had grown up with so many of the same people, which is always fun, so when I shoot their wedding, I'll not only know tons of people from church, but I'll get to see a bunch of people that I grew up with, which is always fun (especially for sentimental types like me). So, this has turned into quite the massive post, but I really do feel so blessed to not only get the honor of being asked to be so intimately involved on one of the most important days of their lives, but that I get to know too really cool, sweet people better, and made new friends. I've said it quite a bit on this blog, but that really is one of my favorite things about my job (of many favorite things), that I get the privilege of really knowing people, (and to be fair, I get to know some couples better than others), but when I make genuine friends, I think, what could be better than that? And that's really how I feel -- I get a job to be in the midst of people's most joyful of days, and the bonus is that I often keep those same people as friends, and get to be their photographer (and friend), as they go through the different steps in their lives; first (and more) pregnancies, shooting new baby, and family portraits, and the delight of watching them grow into families and parents. It's a pretty amazing thing, and I'm incredibly blessed that people invite me into their lives like that. And as I said, in my conversations with Monica and Brandon, in particular, it was so interesting to hear their stories, and to realize just how similar our childhoods/upbringings had been, and how much we had in common...I'm really looking forward to getting to know them better, because just within the little time we had together, I grew to like them both so much, and to feel even more blessed, that they'd asked me to shoot their wedding! So Monica and Brandon, if you read this -- we'll try and schedule dinner soon, so we can get together, AND I really hope you're happy with how your engagement session turned out, I'm really happy with the photos, and I'm looking forward to shooting your gorgeous wedding in just a few months! 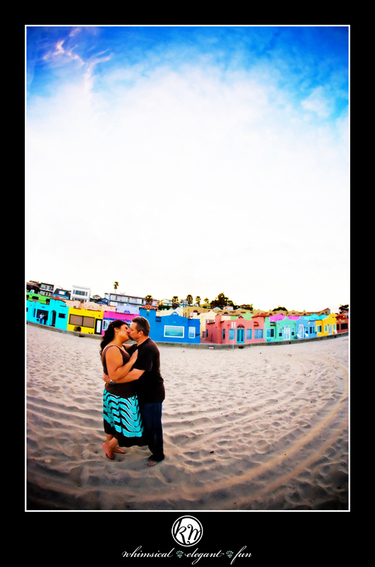 Now back to Joyce and Michael's engagement shoot down at Capitola Village and Capitola Beach!! I met Joyce through Ross, and they actually went to high school together, and re-connected through either myspace or facebook. Joyce had recently gotten engaged, and Ross recommended me. So not only did I get another fun couple to walk with them through their engagement and through to their wedding (and beyond), but Ross was able to get in touch with an old high school friend (and to top it all off -- Joyce brought me two albums chock full of old high school photos, that had some really fun shots of Rossy in high school, which were a total delight to look through; for both me AND the girls; they had a great time giggling and pointing at daddy in high school). 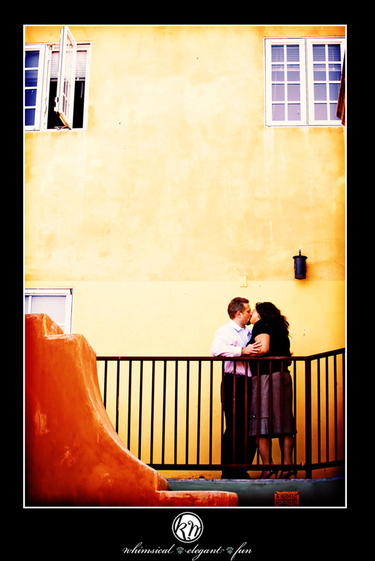 So we shot their engagement photos down in Capitola Village, because that's where their first official date was. So for them it's a really pretty locatoin to walk around, but it also holds a lot of significance for them. And I doing shoots where we walk around getting to know a couple, and get a bunch of different 'looks' while we're doing portraits, but I especially love, love, LOVE shooting places that are meaningful and significant to people (I'm sentimental like that). 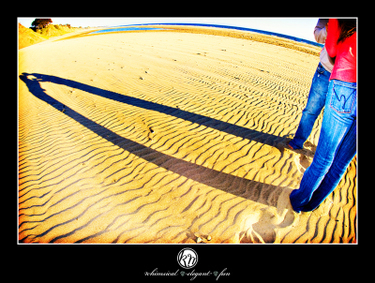 =) Being in a meaningful place makes the photo shoot all the sweeter. 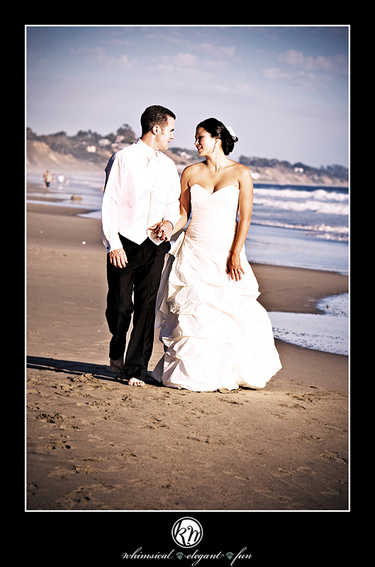 So we had a great time walking around Capitola Village; talking about their lives; when they were first dating, all the wedding details, their jobs, and of course, we also happened to take a few pictures in between. =) After we walked around the village for awhile, they changed clothes, and we went down onto the beach, once the sun was finally low enough to capture the gorgeous sunset light. So I had a great time getting to know Joyce and Michael better as people, along with giving them some fun photo tips. Michael seems to be a bit of a photo buff, so he was asking lots of how-to type of questions, which is fun for me as I love teaching people, so I was showing them how I did certain things, while at the same time teaching them fun and flattering poses. I'm really happy with how they photos turned out. I love the vibrancy of the colors, along with how happy Joyce and Michael were to try out new, fun things. All that combined made this a really fun shoot for me, and not only that, but we ended up with some really great portraits of them, while they got some portrait practice in for the big day! 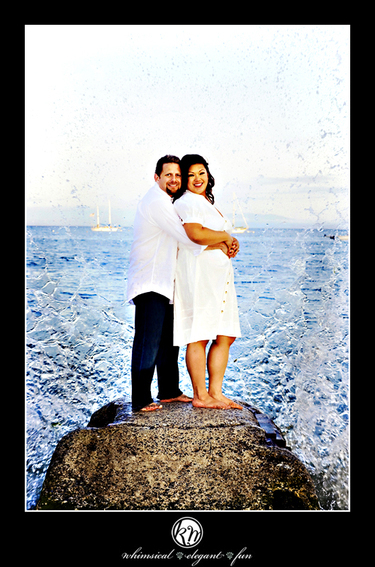 Thanks Joyce and Michael, for your enthusiasm and fun -- I know we're going to get some great photos on your wedding day!! And I hope you liked how they turned out as much as I do! If you want to see more fun photos from their engagement shoot, click on the 'continue reading more...' link below, for more of my favorites! 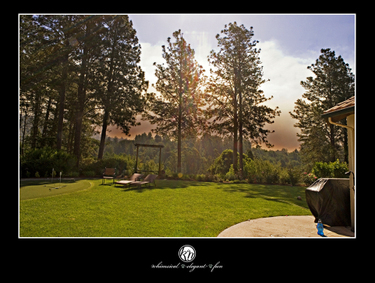 Santa Cruz Mountain Fires, or "Summit Fire"
I took a shot of the plumes of smoke from my mom and dad's house just an hour ago. Check out the smoke! The fire is raging a path between where we are right now (mom and dad's house), and our house (in the Corralitos/Watsonville/152 area). You can smell the smoke, and the wind is NUTS right now. It is a serious fire, and they just reported on the news that it's expected to quadruple in size (and it's gone from 100 acres to 2,000 in just a few hours). 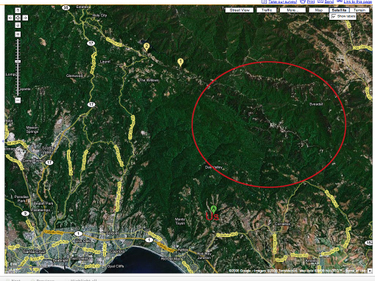 The winds are blowing like the Santa Ana's, about 40mph, which is unheard of here, and at this time of year. And they JUST reported on the news that they're evacuating all of Corralitos, which is CRAZY as it's super-populated (and close to our house).